Camping and hiking are wonderful, cheap ways to spend a weekend getting some exercise and enjoying the outdoors. Camping is a hobby that one can enjoy for his or her entire life. Getting out to the best campsites can be a daunting and expensive task, but only if you allow the costs to add up. You have never camped before, but you want to get into it and make a few trips this summer. You own no camping gear, and you want to buy some. You are planning on taking three friends with you. You have agreed to split costs evenly. You don’t want to spend more than $200 each. If you and your friends prepare properly, you will save lots of money on an outdoor adventure. The more you are self-reliant, the less the trip will cost. Knowledge costs nothing to keep, so practice and preparation are your main tools in keeping your budget low. YouTube is a plentiful resource for instructional videos on outdoor skills. Backpacker magazine has videos on basic camping and hiking practices. Poking around these and similar YouTube channels can give you a quick, free set of lessons on low-cost alternatives to purchasing expensive camping equipment. The Survival Guide app is a free pocket version of the Boy Scout’s Survival Guide, and another option to learn and prepare before leaving for camp. One 4-Person tent- $180 DO NOT skimp on quality when acquiring your tent. A cheap tent can break, be improperly sealed in the eventuality of inclement weather, or let in bugs, all of which could ruin your trip. Good outdoor shoes are also a must. A good pair of boots or cross-trainers can be the difference between a good trip and a horrible one. Cheap shoes can cause injuries, get ruined in water, or cause general discomfort which will not be able to avoid while in the wilderness. Sleeping bags Blankets- $60 You can do without sleeping bags, especially if you are camping at a free campsite in the summertime. A couple fleece blankets and a pillowcase full of clothes will suffice for a warm, comfortable night. Food and drink- $40 A weekend excursion for four should include trail mix, jerky, and other imperishable foodstuffs. Bringing hotdogs, vegetables, or canned goods to cook over the fire can be low-cost options as well, especially if you plan on making a foil dinner. If you’ve learned how to fish from your extensive preparation, catching your dinner can be a cost-effective way to eat like an Outdoorsman. Knife/Multitool- $15 Unless you’re planning on field dressing a deer, a basic camping knife or multitool is all you’ll need to whittle sticks into campfire skewers, spread peanut butter on bread, or fillet your newly-caught fish. Lantern/flashlight- $3.50 While you can find cheap flashlights for about the same price, making your own is just so much cooler. Lighter- $1 Any gas station lighter will do. You should know how to start a fire by now from your extensive YouTube preparation, so you won’t need coals or firewood as long as it hasn’t rained recently. Sun protection – $8.00 Lifeguards recommend Banana Boat, which is what I use. The sports performance formula stays on a bit longer through sweat, swimming, and other strenuous activities. Tinfoil – $7.00 Using tinfoil for Foil dinners, plates, and any other disposable surface is a cheap, recyclable way to keep your campsite clean. Plastic Bags – Free Bring some old shopping bags to keep your goods inside your tent, and for cleaning up your campsite when you leave. There are many free campgrounds in the United States. For the tech-savvy camper, Woodall’s RV & Camping Copilot has information from over 12,000 different camp sites around the North American region, including recreational activities, pet rules, swimming areas, Wi-Fi hotspots, pricing, directions, and more. Look for “primitive” campsites when selecting a free space, as these campsites generally have a tenting space, an outhouse, and a fire pit. If you have a friend or a relative who knows of a hunting camp, they are rarely used during the summer and may offer you a free or cheap alternative. Large rural properties like farms also make great camping options if you are friends with the owner. Gas- $60 This is a liberal estimate, assuming you will drive 300 miles for a free campsite, while requires one full tank of gas to get home. Total Cost- $574.50, or $143.63 per person. NOT BAD! And the next camping trip will only cost $100 for food and gas. For your subsequent camping trips, you can add more gear to your inventory, splurge on a nicer campsite, or learn new skills through outdoorsmanship classes. There are also outdoorsmanship classes that can teach you skills like fire-building, water safety, how to build a shelter, foraging, trapping, hunting, navigation, and survival skills. These classes can be found all over the country, usually at local or state park districts, hunting clubs, and outdoor climbing facilities. REI, Bass Pro Shops, and other outdoor retailers offer workshops and classes for less than $100. If you would like a nicer campground, paid campsites can have amenities such as fully electrified cabins with showers, running water, parking lots, and nearby stores. 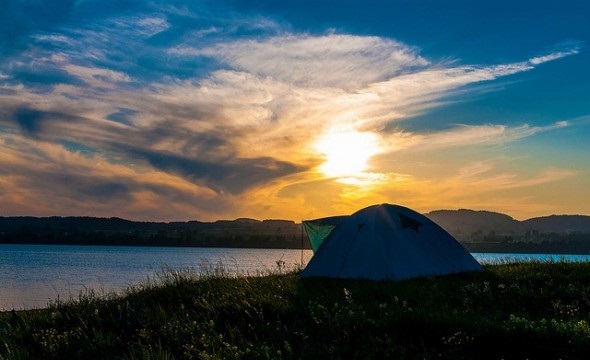 Depending on your state, campgrounds can have fees as high as $35/night, so doing some research before you leave the house can help you and your camping buddies pick a great campsite. Sleeping bags- If you ever get sick of your blanket fort, a three-season bag rated for 30-40 degrees will do fine. If you get too hot, unzip the bag or lose a layer of clothing. Sleeping bags should not cost more than $50/each. Camping accessories- This is where most people expend their budget once they have the essentials. Here are my picks for the best lantern, flashlight, a multitool, a first aid kit, insect repellent, sun protection. All the other fancy gear can be done without, but browsing for things and reading reviews never hurts. A camping radio, for example, is definitely not needed, but can be a nice addition to your tent. Sleeping mat- If the ground under your tent is cold or wet, sleeping at night can be uncomfortable. A sleeping pad under your sleeping bag can be a lifesaver. Sleeping pads should cost less than $40, especially if you buy used. Camp Stove- If you bring imperishable food and don’t plan on cooking or using the fire pit, a camp stove can save your cooking pots and pans from getting charred in the fire. These should cost less than $80. Camping cookware- A pot, a skillet, a pair of tongs, and some forks or spoons to eat and you are ready to eat like a king, especially if you get sick of foil dinners. Cooler- Bring your own drinks in a cooler, especially if you are camping out in the summer heat. You can also use the cooler for bringing your trash home at the end of the camping trip. A cooler shouldn’t cost more than $30. If you know someone who has camping gear, try and borrow it! Purchasing gear online through discount websites like Sierra Trading Post and The Clymb can help reduce the cost of your outdoor excursion. Buying used gear on eBay or Craigslist can be overwhelming when looking for things like fire kits and tents, but deals on used gear can be very lucrative. If you know that you won’t be taking camping up as a lifelong hobby, renting equipment may be a cheaper alternative than buying. Certain campsites offer rental equipment for modest fees. Camping stores like REI have varying rates as well, but their rental charges for non-members are generally around $50 for two days of camping. That same tent can cost almost $300 in the store, or six weekend trips. Similar tents on eBay can cost half that price, however, making whether or not the investment in a tent depend on your summer plans. If you plan on going camping only once or twice a year, then renting your gear may be cheaper. Once you purchase all the gear, camping becomes much more affordable as a weekend outing. Your first, 4-person trip costs less than $600, but once you buy the big-ticket items like shoes and a tent, each subsequent trip is only about $100, or $25 per person. Adding new gear when your budget allows will make camp outs that much more enjoyable, and provide you with a new hobby that you can enjoy for years. So, if you are looking to pick up a new hobby that provides low-cost, outdoorsy vacation options, buying some gear and getting outdoors may be the right thing for you. Update: Saving up enough money so you can reach your financial goals and enjoy your hobbies along the way can be tricky. So many people reached out to us saying they wanted help with financial planning, that we built a tool to match you with a financial advisor who can meet your needs. First you answer a series of questions about your situation and your goals. Then the program narrows down thousands of advisors to three fiduciaries who meet your needs. You can read their profiles to learn more about them, interview them on the phone or in person and choose who to work with in the future. This allows you to find a good fit while doing much of the hard work for you.